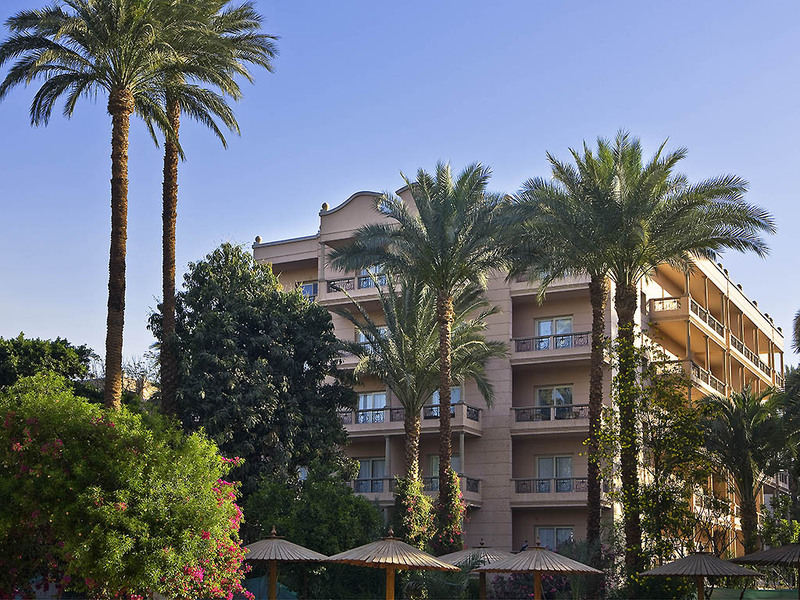 In the very heart of the city of Luxor, the 5-star Pavillon Winter Luxor perches on the banks of the River Nile, nestled in the midst of lush tropical gardens, close to the International Convention Centre and all major local business venues. The contemporary gives way to the timeless in the surrounding areas of the hotel, where some of the world's most fabled archaeological sites, from the Luxor Temple to the tombs of ancient kings and queens, have endured for millennia and await your visit. This gourmet Luxor restaurant pays tribute to the beautiful magenta bougainvillea that drapes the ancient gardens. Dine on Mediterranean specialties for breakfast or dinner, in a sunlit dining room that spills out to a vast terrace. Swim up to the counter of this chic bar in Luxor, surrounded by water and the hotel's lush gardens. Unwind on a shaded lounge chair while you order a cocktail or refreshing mint iced tea to go with your gourmet light lunch.